She made the comments after having challenged Sasha Banks to a fight earlier. The original post in the thread was Becky Lynch issuing a challenge to Sasha Banks. Lynch posted the comments not long after news and rumors regarding Banks and Bayley’s WWE status began to circulate this week. Sasha Banks & Bayley The Boss N Hug Connection lost the WWE Women’s Tag Team Championships at WrestleMania 35 to the Iiconics. On Raw the following night, Bayley lost a single’s match to the returning Alexa Bliss. Banks was not on the show. Banks’ situation was addressed in a recent edition of the Wrestling Observer Newsletter: “According to one person high up, Banks tried to quit over the weekend, as she felt blindsided when finding out at the last minute that they were taking the tag team titles from her and Bayley.” What Is Going On With Sasha Banks This Week? 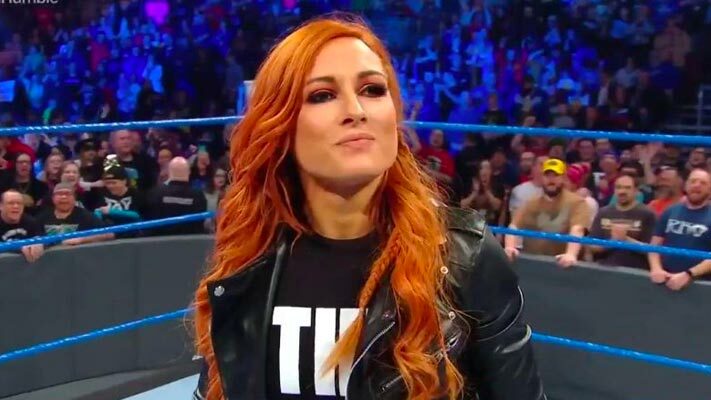 Becky Lynch vs Lacey Evans On WWE programming this week, Becky Lynch took part in two different segments with Lacey Evans, one on RAW and another on Smackdown. While Lacey Evans has yet to actually wrestle on RAW or Smackdown, she has been wrestling on WWE live events. In recent weeks, Evans has been teaming with Alexa Bliss in matches against Natalya and Nikki Cross on live events. Becky Lynch recently told Bayley she’d love to “slap her head off” on Twitter. She made the comments after having challenged Sasha Banks to a fight earlier. The original post in the thread was Becky Lynch issuing a challenge to Sasha Banks. Lynch posted the comments not long after news and rumors regarding Banks and Bayley’s WWE status began to circulate this week. The Boss N Hug Connection lost the WWE Women’s Tag Team Championships at WrestleMania 35 to the Iiconics….